Top of Roose Rise, Maungatapere. There will be signposting to guide you. See map here. You may have to walk some distance to the start area so please be prepared for this. There is very limited parking available on site, please be considerate of others and try and carpool if possible. There will be additional car parking on the day at the start of Snooks Road with a shuttle service to the event. Organisers will advise of this closer to the event, please check the website for details. Don’t forget to read the waiver! This will be held at the start/finish area at 12:15pm, we will be acknowledging the first three finishers and the top team and we have some incredible spot prizes to give away but competitors must be present to claim these! Bring a picnic rug and enjoy the atmosphere!! This event is held on private land, please respect the owners land and animals at all times. Where there is a marked out area for participants, you are required to stay within that area at all times. Marshalls will be wearing high-visibility vests and are there for your safety. Follow their instructions and those of the event organisers at all times. The course will be clearly marked, you are required to adhere to the course route at all times this will be explained at the safety briefing on the day. A tail marshal will be following the last participant. If assistance is required please stop and wait for the tail marshal, or notify the nearest marshal. No animals (except guide dogs) are permitted on the event property at any time. It is possible that you may be running through mud, through water obstacles and handling rope. Here are a few precautions to limit the possibilities of getting sick/injured/infections/cuts and/or bruises. Do not swallow any mud/water on the course or get any in your mouth. Cover any cuts/scratches to ensure they do not get infected- please seek medical advice prior to the event if unsure. When entering mud/water please be cautious and be aware of what may lie beneath it as there could be branches etc. that could cause injury. Be cautious entering any mud/water as you don’t know how deep it is. If you are sick on event day or leading up to it, do not participate. Your illness may be contagious and may put other participants at risk. Tape and or support ankles to avoid sprains, as this course is on a farm and the terrain is rugged. It is compulsory to wear covered in shoes, however spiked or studded shoes are not permitted. 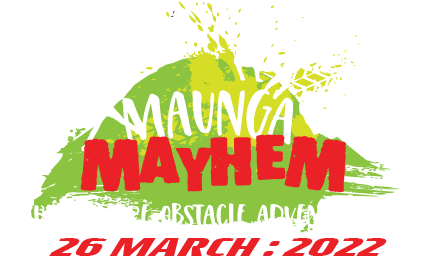 Participants in the Major Mayhem may want to wear gloves and tape their shoes on due to the water obstacle in their event. Remember it could be cold and you will get wet, therefore you will need to bring a towel and dry warm clothes for after the event. If it is hot please remember to wear sunblock. There will be toilets available at the start finish area. There will be no changing or shower facilities. There will be food and drink available for purchase at the event (No EFTPOS facility available). Please note this is a smoke and alcohol-free event. While we will endeavour to make a decision to cancel the event as early as possible due to the nature of such events situations can occur quickly and without warning close to the start of an event.